And that is how our conversation began. Oh, Goodbye June, what are we going to do with you? With the release of the album comes the fun work of taking it on the road in order to bring the music to the masses: they will be doing so at festivals along with a co-headlining tour, hopefully, coming to a venue near you. Heads up, that co-headlining tour is with these friends of mine: Badflower. The music gods are good so bring your earplugs, kids: it’s going to get beautifully loud. Landon: It’s called Magic Valley and that’s just a little hint from a small town in our past in West Tennessee. The sound kinda encompasses just us growing up and there’s a lot of different vibes in it. It’s pretty much straight up rock and roll, but, also very nostalgic and there’s heartache and younger years talked about a lot. We’re really proud of it. We’ve been working on it for three and a half years now. Brandon: I was in painting in West Tennessee, just houses. Als,o at the time, me and Landon were in the middle of a rock band together at that point. Landon, he was just in school. He was a teenager, like 16 years old, and taking him into bars and stuff, playing shows. Tyler, you were in school, right? Tyler: Yeah, I was in school. I was a busboy at a Chinese buffet. We’re pretty normal dudes. Brandon: Yeah, definitely. Blue collar, families, Midwest, hillbillies. Tyler: Yeah, got a lot of hillbillies in our family. Brandon: We’re probably the classiest of the bunch. Landon: …he should be arrested. I think the hardest transition for us was transitioning from growing up with in a Pentecostal home and I think it was harder for us dealing with our families than it was with everything else. I think that was the hardest part. Hoping they would accept everything that we were doing because it was so completely different than the church. We were all supposed be in the church and be preachers and music ministers and youth pastors and all that stuff and we kinda went the complete opposite route. That was the hardest part for us, I think overall. 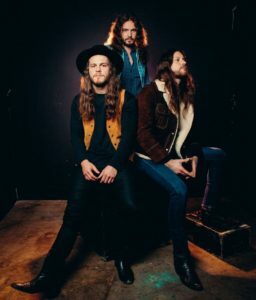 Landon: Nashville is a very songwriting town, so, we definitely had a year and a half or so where we just had the time – we were blessed with it, honestly – to really just hone in on what we were doing and find cool new sounds. That really helped. Paul Moak, our producer who produced the album, he’s got a killer studio here in town. As soon as we first started, he’s the guy we wrote “Daisy” with. We don’t co-write with too many people and he’s one of them. His studio, it just draws out the creativity and inspiration, really. We just instantly connected with him and his place and fell in love. Tyler: Getting on with Interscope was a big deal to us. They’ve been a pleasure to work with, so far. They’re not necessarily a rock label, even though they’ve had legendary rock bands. They’re more of kinda of a pop, alt-pop label right now, their current state. They love what we’re doing and wanted to see if they could help us. That’s been been really good. Management and all that stuff, so far, it seems like we’ve lucked out. Maybe we’ll do a follow up interview in a year or two and I’ll have more to tell you. Brandon: We’ve always approached it as just treat everybody normal and the same. Turns out, everyone kinda likes that. So, as far as meeting people, other musicians or whatever, we’ve always just been chill, easy to get along with guys and I think that’s translated into our career. Like Tyler said, everyone’s been super easy to work with. Brandon: Yeah, we both met Mark Hoppus in the hallway after our show. They were headlining and we played like four, maybe five bands in front of them. We just happened to be walking through the hallway and me and Tyler see Mark Hoppus standing in the hallway. Tyler shook his hand. Tyler, you can say what you want from here. Yeah. So, I said, “Holy cocksucker.” Then, Mark just stared at me. I listened to Blink  a lot growing up. I was just so starstruck and off way on my heels, I just wasn’t prepared at all. He just looked me and said, “Hey man.” I literally shook his hand and turned around and left. I didn’t say another word. I didn’t say “I’m sorry.” I just turned around and left. That’s my most recent proud moment of putting my foot in my mouth. Landon: I like that. We were all just hanging out at our old studio on Music Row one day and we just started. We had this idea in mind and we all immediately started falling in love with the direction we started going in. Kinda going back to what we were talking about earlier, like about that whole transitioning thing from faith to not really having; not necessarily not having faith, but not having faith that you grew up with and the whole church, spiritual experience. Even more to that, the whole growing up thing in general, I think that’s what that song kinda encompasses. It’s just super nostalgic, family driven, spiritual driven thing. We’re not the same people we were growing up and making that transition was tough, but, it’s who we are now. It’s kinda that thing. Tyler: ‘I used to fear Jesus back then’: some people take that I used to be afraid of Jesus back then and now I’m not. What’s funny is I think – and I’ll speak for myself – when we were writing lyrics, how I took it was when we grew up in the Pentecostal world, to fear God or to fear Jesus was to show love and respect. That’s a reverent thing. The belief and the fear of God, you tremble at the sight of God. What’s funny is a lot of people are reading into that song in different ways and it’s interesting. When we wrote it, that’s what it meant to us. Basically, I used to be reverent of God back then, now I just run kinda thing. Brandon: That’s kinda what we wanted it to be like. We always kinda envisioned that song closing out the album. It’s probably one of the most honest songs that we’ve ever written and vulnerable. I think that’s it just really special to us and we thought that it would be a great way to say goodbye on an album, just close it out. Glad you like it.